idli upma recipe - quick 15 minute recipe of upma made with leftover idlis. heat 1 tablespoon oil in a pan. add 1/2 teaspoon mustard seeds and let them crackle. when they start crackling, add 1/2 teaspoon urad dal & 1/2 teaspoon cumin seeds. saute till the urad dal turns golden. then add 5 to 6 curry leaves (chopped or kept whole), 1/2 teaspoon finely chopped ginger, 1 dry red chili and 1 green chili (chopped). you can also add a pinch of asafoetida at this step. stir and then add 1/4 cup chopped onion. then add the crumbled idli. also add a bit of salt. mix very well and saute for a minute or two. then switch off the flame. lastly add 1 to 2 tablespoons chopped coriander leaves. at this step, you can also add some grated coconut. 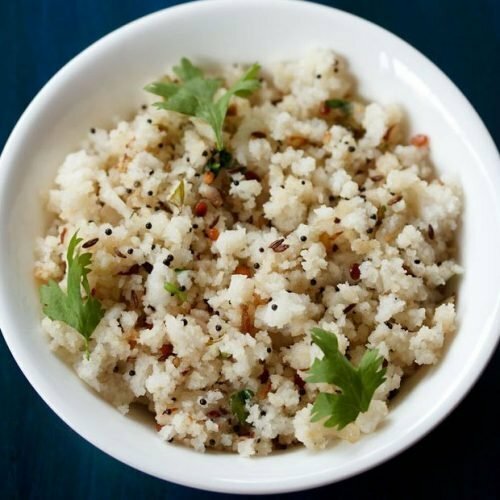 mix again and serve idli upma with some coconut chutney or lemon pickle.